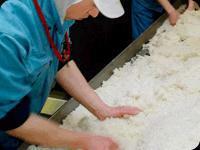 Learn How to Make Miso Paste at Nagano City’s Premier Miso-Maker Suyakame. Not far from the venerable Zenkoji Temple in Nagano City you'll find the historical miso factory, Suyakame. 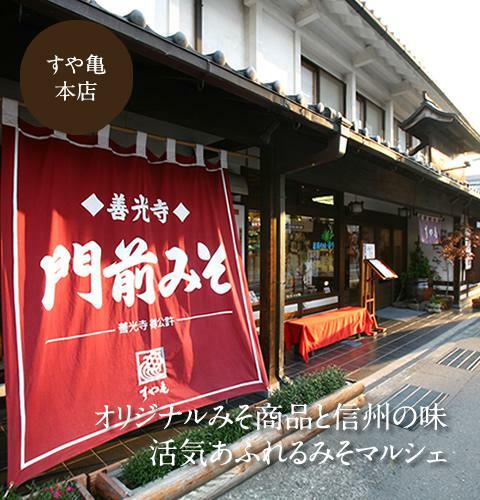 Their high quality miso has won numerous prestigious awards in Japan. Here you can learn how to make miso yourself. After taking a tour of the miso making facilities, participants will mix soybeans, salt and malted rice to make their own miso. Store it at room temperature for a minimum of 3 months and it will be ready to be made into miso soup. Open year-round except Jan. 1st and 2nd. 5,150 per person. + Shipping if required. Instruction in Japanese. Miso takes 3-6 months of fermenting before becoming edible, so take it home with you and look forward to eating it! Store has a gift shop and restaurant on the premises. From Nagano IC, Take Route 35 north. Continue north after intersecting with Route 77. At the Prefectural Office signal turn right on to Showa Dori street then left at Minami Agatamachi signal and right at 2nd Minami Agatamachi signal for 2 blocks.